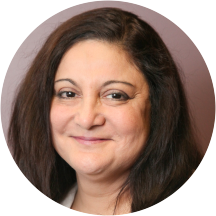 Dr. Shaista Husain is a board certified Otolaryngologist/ Head & Neck Surgeon who practices in the Houston area. As an otolaryngologist, Dr. Shaista Husain devotes most of her time to treating patients with diseases of the head and neck area including tumors, cysts, polyps, lesions and nodules of the ears, nose, paranasal sinuses, oral cavity, pharynx, larynx, neck, salivary glands and skin. She is particularly interested in treating patients with thyroid nodules, thyroid growths and thyroid tumors, benign or malignant. Managing head and neck tumors involves a multidisciplinary approach where practitioners of multiple specialties, such as head & neck surgeons, radiation therapists, prosthodontics, medical oncologists, radiologists, and social workers, come together to create a treatment plan. The process begins with a patient who presents with a thyroid swelling, lump, or hoarse voice. This patient should be examined by a head and neck surgeon. Using the examination findings along with pathology from a fine needle biopsy, a diagnosis of pre-cancerous, cancerous, or benign lesion can be made. If the diagnosis of thyroid cancer is established and the cancer stage is determined, Dr. Husain often will present the case to a board of highly specialized doctors, the tumor board, for a multidisciplinary approach to planning treatment and management of the patient. Shaista A. Husain M.D., F.A.C.S. Over 20 Years of Academic Experience in Head and Neck Surgery.